Two leading US climate research bodies have declared that 2014 was the warmest year since records began in 1880, with surface temperatures about 0.68 Celsius (33 °F) higher than the historic average. The data was announced jointly by two separate teams working to interpret measurements collected from 6,300 weather stations dotted around the world – NASA’s Goddard Institute of Space Studies (GISS) and the National Oceanic and Atmospheric Administration (NOAA). Although the year was just marginally hotter than 2005 and 2010, 13 out of 15 of the hottest years on record have occurred since the turn of the millennium. “The record temperatures should put to rest the absurd notion of a “pause” in global warming. Human-caused warming of the globe and associated changes in our climate continue unabated as we continue to raise the concentrations of greenhouse gases in the atmosphere,” Michael Mann, renowned Penn State climatologist and author of the iconic “hockey stick” diagram, wrote in an email to the Washington Post. The record is particularly notable since it did not occur during a year of El Niño, a warm ocean water phenomenon that customarily pushes up temperatures and gives the graphs a characteristic jagged look. “This is the first year since 1997 that the record warmest year was not an El Niño year at the beginning of the year, because the last three have been,” said Schmidt. Although land temperatures were only the fourth highest on record – as opposed to the record-breaking ocean measurements – new highs were reached in multiple places, including swathes of continental Europe and the UK, parts of Australia, and the western United States. 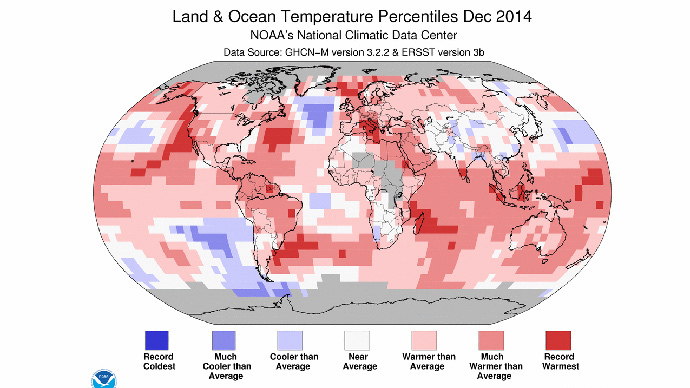 In contrast, the eastern seaboard enjoyed an unusually cool year. Despite the figures likely setting the tone for the climate change debate in upcoming Paris talks, prominent skeptics have hit out at the significance of the headline figure. “Whether or not a given year is a hundredth of a degree or so above a previous record is not the issue. What IS the issue is how observed temperatures compare to what has been forecast to happen,” stated Pat Michaels, director of the Center for the Study of Science at the right-wing Cato Institute, noting that the figures fell far short of the rises predicted by Mann and others just a few years ago. Several went as far as to doubt whether the respective measurements in the atmosphere and on the surface fitted the existing models – and some even cast doubt on the reliability of the raw data collected by buoys, ships, and other stations. “There remain significant uncertainties in the accuracy of the land portion of the surface temperature data, where we have found a significant warm bias. Thus, the reported global average surface temperature anomaly is also too warm,” claimed Roger Pielke, professor of atmospheric science at Colorado State University.